Economy of coal in house fires; or, how to convert an ordinary fire-grate into a slow combustion stove at a small cost. [With] Some related ms material and trade ephemera. T. Pridgin Teale, surgeon to the General Infirmary at Leeds, devised a method of controlling the draft of a fireplace from below, using his "Economiser", a box placed beneath the grate with an adjustable air-shutter at the front. This novel but now obvious method of controlling an open fire, became standard. Teale's book on the subject, expanded from a lecture delivered to the Leeds Lit. & Phil. 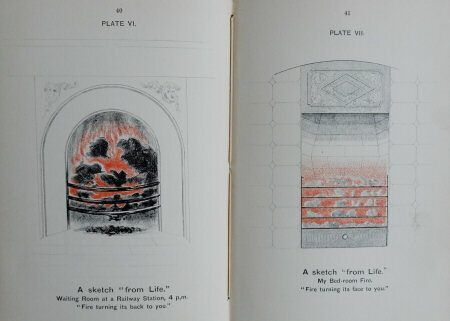 Society in 1882, describes the device in full, showing how effective it is in contrast to ordinary fireplaces, which he illustrates with graphic captions. By 1890, the Teale Fireplace Company had been established in Woodhouse Lane, Leeds, with works in Kelsall Street, run by Lionel Teale, presumably the son of the inventor, and Richard Somers. It manufactured every kind of heating apparatus. Carnegie was desirous of fitting Teale fireplaces but Lionel Teale directs him to Walker & Sons of Bunhill Row, who must have been licensed to sell the apparatus, and the rest of the correspondence is with this firm, discussing the actual design of the grate for Carnegie. 8vo. 47 + (1)pp incl. 10 plates, some with colouring. Orig. decorative cloth, shaky. Bookplate of the Hon. John J. Carnegie. Together with a small collection of printed ephemera and some correspondence between the Teale Fireplace Co, Walker's of London, who stocked their fireplaces, and Carnegie of Fair Oak, Petersfield.